AleaSoft, January 28, 2019. AleaSoft analyses the behaviour of the price of Brent, fuels and CO2 so far in January, as well as the main European electricity markets. In AleaSoft it is estimated that prices of European markets will remain high for the first half of February. The Brent oil price has been around 60 dollars per barrel since January 10, which is the equilibrium value that we have been quoting in AleaSoft since 2018. At the beginning of October 2018, Brent price rose to 86.07 dollars per barrel and at the end of 2018 it came down to 50.57 dollars a barrel. The rise this year is around 20%. The situation in Venezuela may trigger a sharp rise in Brent prices. A US blockade or sanction would harm 40% of Venezuela’s exports and leave the country without much of its income with an industry that produces less and less due to lack of investment and maintenance. At a global level, the economy growth has slowed, so a Brent price above 60 dollars per barrel may be counterproductive for the development of most countries that are importers of oil or its derivatives. The TTF gas futures for February fell from 21 €/MWh for the first time since the beginning of November last year when they traded at 25 €/MWh. In the same way, the API2 coal futures for February fell for the first time from 80 $/t since early November when they were trading above 98 $/t. The downward trend of gas and coal augur a similar trend for the European electricity markets prices in the coming weeks. On the future prices of the CO2 emissions rights, since mid-December 2018 they have been about 22 €/t most days, reaching 25 €/t on some occasions. These increases in CO2 prices have a direct impact on the price of European electricity markets. At the end of January, values are around 22 €/t with a flat trend. 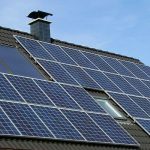 Since the beginning of January, average prices in the main European markets have been around 60 €/MWh. 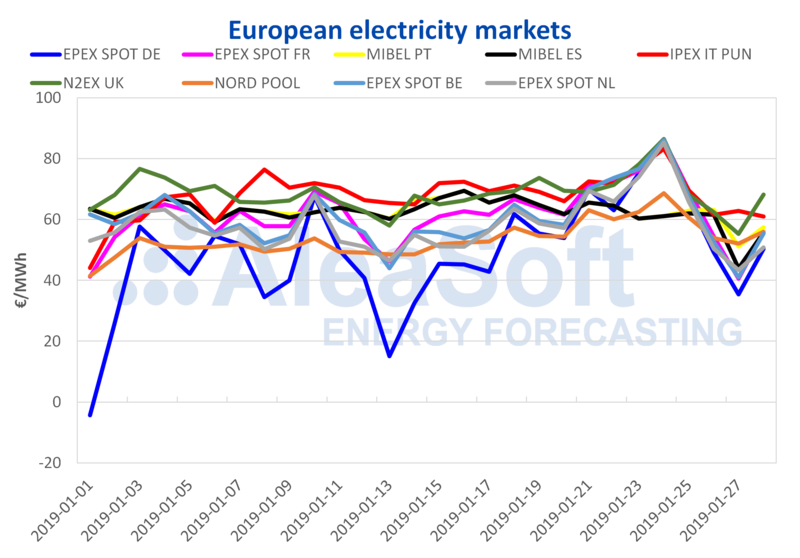 The highest values were reached on January 24 when almost all markets exceeded 80 €/MWh (EPEX SPOT Germany, France, Belgium, Netherlands, IPEX Italy, N2EX UK). The MIBEL Spain and Portugal markets remained above 60 €/MWh due to the high wind energy production. The Nord Pool of the Nordic countries reached 69 €/MWh on January 24. 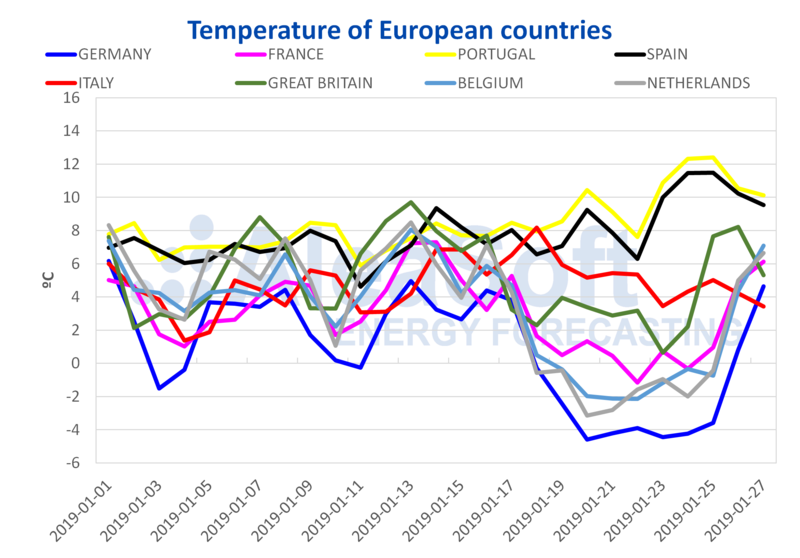 Although the cold snap is already gone, temperatures for the beginning of February will remain cold and the electricity demand will continue to be high. In general, prices in the first half of February will remain high, following the average trend in January, although not as high as in January 23, 24 and 25. 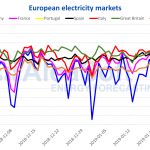 The futures of Spain and Portugal in the OMIP market for the month of February 2019 have been trading above 60 €/MWh, as well as the futures of France in the EEX market, which, in the last week recorded a significant decline, from 69.32 €/MWh on Monday, January 21 to 63.63 €/MWh on January 25. For its part, the futures of Germany in the EEX market for February of this year have been trading above 55 €/MWh.